CHAPEL HILL, N.C., Nov. 14, 2018 (SEND2PRESS NEWSWIRE) — The Walking Classroom Institute (TheWalkingClassroom.org) has released results of a research study conducted in spring 2018 by researchers from the University of North Carolina at Chapel Hill, and funded by the Oak Foundation, confirming that walking while listening to The Walking Classroom podcasts improves student learning as well as retention of information, student mood, and attitudes toward learning. The study, which tested 319 4th and 5th grade students over a three-month period, had the students complete a series of measures over four testing periods to assess learning, mood, cognitive performance, and attitudes toward learning. The findings were overwhelmingly positive for The Walking Classroom program methodology. 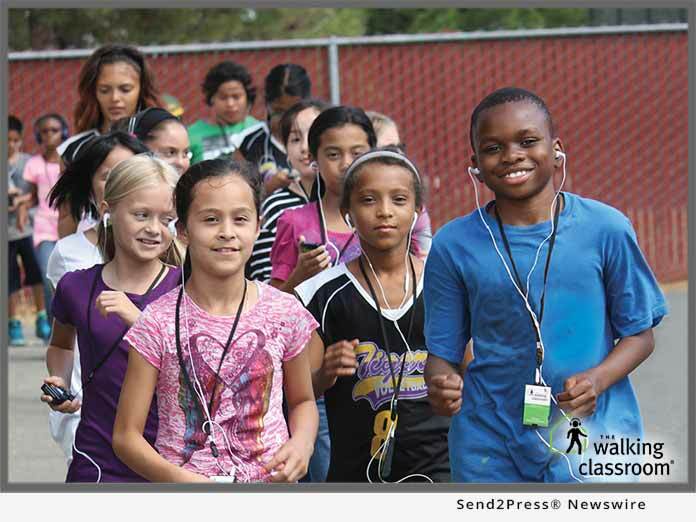 Students who walked and listened to The Walking Classroom’s educational podcasts demonstrated significantly higher levels of learning than students who sat while listening to the podcasts. This result was demonstrated both in short-term and long-term retention as measured by performance on a 10-question comprehension quiz on podcast content administered immediately after the walk as well as one week later. In addition to improvements in learning the material presented in the podcast, walking had a significant positive impact on cognitive test performance. Students were given a 3-minute multiplication test both after walking and after sitting, and the resulting math test scores were significantly higher for the groups that had walked prior to taking the test. The study also tested the effects of walking on student mood and attitudes toward learning and found that walking (versus sitting) had similar improvements in those areas. All positive-affect markers (e.g., students describing themselves as strong, happy, alert, excited, and enthusiastic) increased after walking and listening to podcasts and decreased after sitting and listening to podcasts. Similarly, negative-affect markers (e.g., students describing themselves as irritable, nervous, upset, mad, and sad) all decreased after walking, demonstrating a strong positive influence of the Walk, Listen, and Learn program on student mood and attitudes toward learning. The study was conducted by Erianne Weight, Ph.D. and a team of researchers from the University of North Carolina at Chapel Hill. Its purpose was to test the impact of learning during physical activity on student short-term and long-term learning retention, cognitive performance, mood, and attitudes toward learning. Baseline data was gathered one week prior to listening to the podcasts. Additional results were gathered immediately after walking and listening to podcasts, immediately after sitting and listening to podcasts, and one week after the podcasts were delivered. For more details or to read the full study, please visit https://thewalkingclassroom.org/research/. To schedule interviews with The Walking Classroom founder and CEO Laura Fenn, contact her directly at: laura@thewalkingclassroom.org. A national award-winning education program, The Walking Classroom provides students with an innovative way to get exercise without sacrificing instructional time. The Walking Classroom Institute, a 501(c)(3) non-profit, was founded by CEO/Creator Laura Fenn, a former 5th grade teacher with over 15 years of classroom experience. Laura developed The Walking Classroom program as a way to add exercise to the school day without sacrificing instructional time. While all students benefit from the increased activity and educational content of The Walking Classroom, children with low academic achievement and childhood obesity stand to benefit the most. Students with alternative learning styles such as ADHD, dyslexia, or autism also benefit from the program. The Walking Classroom program is now used by tens of thousands of students in all 50 states. * Photo credit: Laura Fenn. "Knowing that The Walking Classroom is actually helping students learn more and retain more information, while also helping them feel happier and more excited about learning, is very rewarding," said Laura Fenn, CEO and founder of The Walking Classroom. 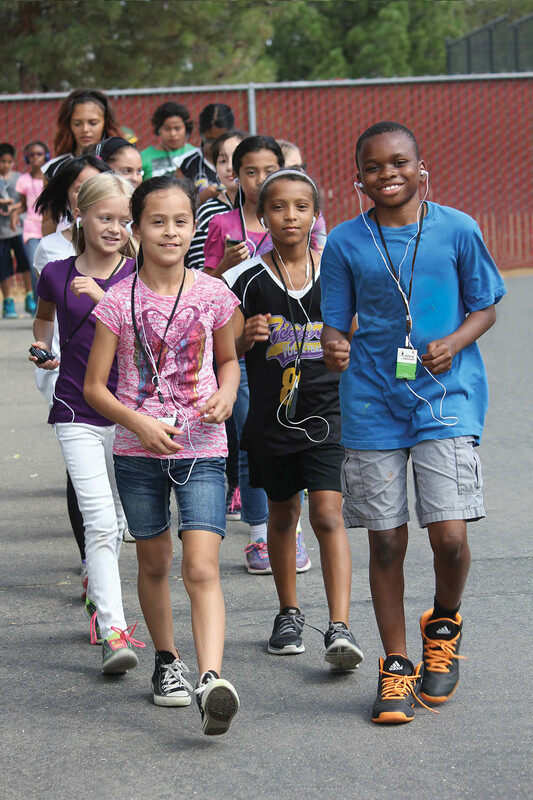 A national award-winning education program, The Walking Classroom provides students with an innovative way to get exercise without sacrificing instructional time. The Walking Classroom Institute, a 501(c)(3) non-profit, was founded by CEO/Creator Laura Fenn, a former 5th grade teacher with over 15 years of classroom experience. The Walking Classroom program is now used by tens of thousands of students in all 50 states.